The life and legacy of Martin Luther King Jr still ripples through our country and our world. His dream still inspires us to work for a better tomorrow. His courage reminds us that one man really can make a difference. His humility reminds us that the only ones who make a lasting difference are the ones who live for something bigger than themselves. His assassination reminds us that darkness hates the light. His life and legacy also remind us of the power of the gospel to change hearts, cultures and nations. MLK’s approach to racial justice was saturated in an understanding of the gospel. A few miles from our house is a monument to Dr. King. The last time I was there, I took the above photo. It’s the essence of how MLK’s thinking was shaped by the gospel. 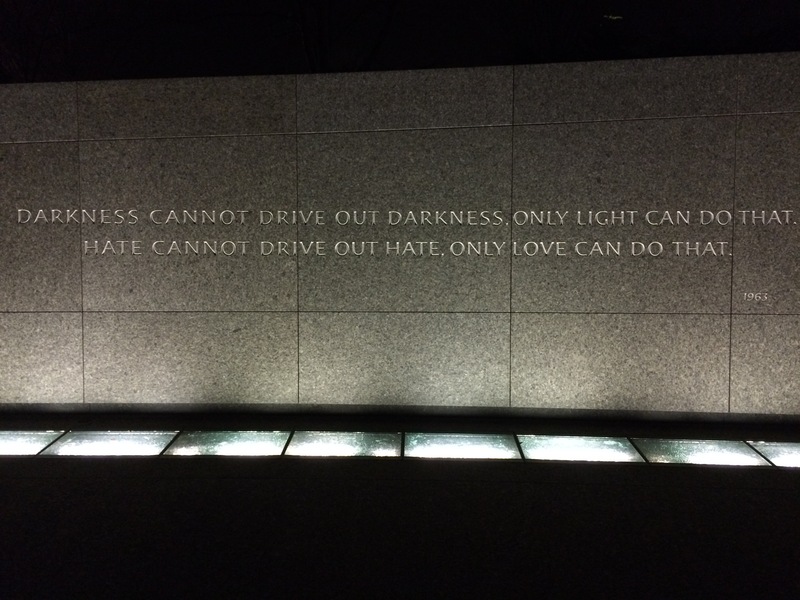 Notice how Dr. King wanted to bring about change, “Darkness cannot drive out darkness, only light can do that. Hate cannot drive out hate. Only love can do that.” That’s the gospel! Dr. King knew that individuals and a country would only give up the dark sins of their past when they embraced the beauty of a better future. He didn’t simply rail on the injustice of racism. He invited a country to believe with him for a better day, a day when “the sons of former slaves and the sons of former slave owners will be able to sit down together at the table of brotherhood.” He gave the country a vision for something better, something that called us out “of the valley of despair” and into hope. People, cultures, and nations change when we find something better than our small minded, self centered sins. That’s the essence of the Christian gospel; Jesus is better and He’s calling you into something better. He offers the forgiveness of sins, eternal life and intimacy with God. He calls us out of our valley of despair and into hope. Jesus is the ultimate “something better.” Don’t try to fight your sins through self-discipline, will power and bashing yourself with consequences. Draw so near to Jesus that He becomes your life and sin looks pathetic in comparison. I love Dr. King and his influence. He reminds me that the gospel isn’t just the good news of personal transformation. It can also become the impetus for profound societal change as well.